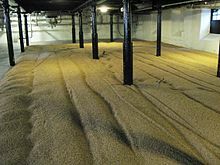 There are only a handful of malting companies in the British Isles who still use the ancient and traditional technique of floor malting. One of these is Tucker's Maltings, in Newton Abbott, near Exeter, Devon. They are the only Maltings in the UK who offer regular guided tours. Another is the Warminster Malt Company, established in 1855. Guinness owned and operated this Maltings between 1950 and 1994. It provided the malt for the famous brew. When they moved out, the new company provided quality floor malt for several small independent craft breweries. The Crisp Malting Group is a large company, with malting plants operating in Scotland and England. They own Maltings in Alloa and Portgordon, Scotland, and also in Ditchingham, Great Ryburgh and Mistley in Suffolk, Norfolk and Essex, respectively. The site at Great Ryburgh is the largest and, as they say on their web page, it provides an insight into the technical developments and innovations that have taken place in the malting industry over the last 150 years. The Ryburgh Maltings was set up in the 1850s. It eventually became the largest floor malting plant in Europe. They still have and use some of the traditional floor malting facilities. Today, however, because of demand, most of the malt is produced using modern equipment. These are the Saladin Maltings, installed in the early 1960s. Circular germinating vats, also known as drum maltings, were added in 1973. In the early 1990s, modern computerised systems were introduced. These modern systems can deal with large amounts of grain but the fundamental processes of steeping, malting and kilning remain unchanged. If you want to see just how huge the modern computerised GKV systems can be, here is a time lapse video of one being built between August 2011 and February 2012 for the Great Western Malting Company. It will replace the drum maltings. In the 21st century, making the equipment for malting has become a big industry in itself. There is also Thomas Fawcett & Sons Ltd, based in Castleford, West Yorkshire, where the original malting floors are still in use, alongside the Saladin Maltings and a state of the art germinating kilning vessel. The family has been making malt since the 1760s. Established in 1809, the family business and company has seven generations of experience of making malt. We contacted them not long after visiting the Corrigall Farm Museum on Orkney where we had seen the traditional 18th century grain barn, complete with threshing and malting floor. Fawcett's were kind enough to take us on a guided tour round the Maltings and explain what they did. That was in 1997, just before I completed my thesis. It gave us an insight into the complexities of malting on an industrial scale. A more recent description of a tour around Fawcett's is here. It seems that not a lot has changed there over the last 17 years. So, where have all the malting floors gone? It's crucial to turn the malt regularly. This aerates it and prevents the rootlets from becoming entangled and matted on the malting floor. This important job has traditionally been done by people, who pulled a specially designed malt rake through the germinating grain. It is a time consuming process. As the malting floors became larger and larger to cope with the demand for beer and whiskey in the Victorian era, so the task of turning the malt became increasingly labour intensive and expensive. In the 1890s, a new mechanised system was invented by Charles Saladin, a French engineer (1878-1942). Named after him, the Saladin box was a large concrete or metal box in which revolving metal forks moved slowly from end to end, turning and aerating the grain as it germinated. The picture below is from a Belgian malting company's web pages, Dingemans, who began to use the new mechanical system in the early 20th century. The malt needs to be aerated and, as time went by, the basic design has been improved with perforated floors, and air being blown through the germinating grain to maintain an even temperature. Drum maltings are essentially the same system, but with circular grain beds, not rectangular boxes. 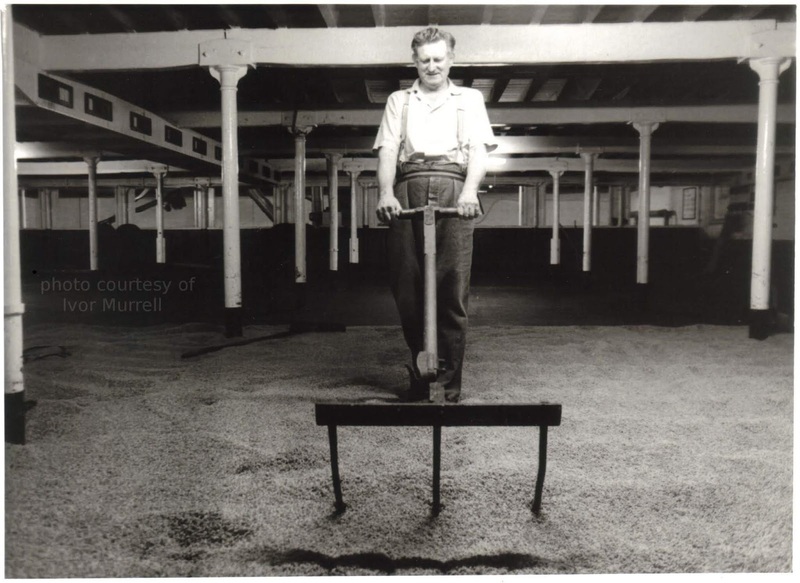 In the British Isles, the malting floors began to be replaced by Saladin box maltings slightly later than in Europe, with the first being installed in Edinburgh's North British Grain Distillery in 1948. They became increasingly popular during the 1950s and 1960s. Saladin boxes and pneumatic maltings, where the germinating grain is aerated, have been improved upon by larger capacity drum maltings and more recently by enormous computer controlled state of the art Germinating Kilning Vessels. Malting equipment in the modern food processing industry has become huge and complex, yet it is still based upon the fundamental processes of steeping, germination and kilning. There is a very good analysis of modern malting techniques and equipment here, Chapter 3 of ' Engineering Aspects of Cereal and Cereal Based Products' edited by Raquel de Pinho Ferreira Guine, Paula Maria dos Reis Correia. Apart from the Nottingham cave maltings, dated to the 13th and 14th centuries, there are very few recorded malthouses or facilities for making the malt in the medieval era. Mostly, malt was made in the grain barn. The cave maltings are unique. Because of the ambient temperature being the same all year round, they could make malt all the time. In a traditional grain barn or malthouse, it was only made in the cooler months of the year, those months with an 'r' in, that is, any month except May, June, July and August when it was too hot to make malt. Over the centuries, as the breweries gradually became larger and more centralised in towns, so the malthouses and malting floors had to become much larger to supply them. The details of the commercialisation, industrialisation and mechanisation of the malting process in England is very well told by Amber Patrick in her report for English Heritage. She explains that the basic 16th century malthouse had two floors, the top being for grain storage and the ground floor was the growing floor. The kiln for drying the malt would be at one end. A good example is the Boyes Croft, Great Dunmow, Essex, a Grade II listed building. By the end of the 17th century, commercial malting was on such a scale that it warranted taxation. The Malt Tax was introduced in 1697 and was not repealed until 1880. The malting industry became highly regulated and the buildings became larger, sometimes with two malting floors, one above the other. Amber Patrick explains that the trend for the last three or four hundred years has been for the malthouses to become bigger and bigger. The Industrial Revolution and the construction of the canals, then the railways, greatly accelerated this trend. It became easier to transport large quantities of malt to the breweries quickly and efficiently. More multi storey Maltings were constructed in the 18th and 19th centuries, usually right by the canal or the railway. The Bass Maltings, above, were built between 1903 and 1906. There was an engine house, to provide the power for shifting around the huge amounts of malt that was made there. It was originally planned to build eight more malting buildings, mirroring the eight that did get constructed. It was a state of the art, hugely mechanised turn of the century floor Maltings, one of the last to be built in Britain. It closed down in the 1960s, with the introduction of box and pneumatic maltings, which could produce more malt at a cheaper cost. While browsing about on the internet, I found some fascinating images of the inside of the Maltings, on a blog about decaying industrial buildings, www.adarkertrantor.co.uk. They were taken in 2012 and they show how this important industrial site was abandoned with much of the equipment still there. Malthouses were huge, multi storeyed and functional, yet they could still be attractive buildings. As I was writing this blog, I looked on the internet for a suitable image of a disused Maltings that I could use. The difficulty in finding an image online of an industrial malthouse is that most of them have been closed down or demolished in the last few decades. Many have been converted into flats and housing developments. Some have become offices and others are Listed Buildings. I came across this recent story from the Newark Advertiser, about a Grecian style Maltings that is up for sale and future development. It is a good story, well worth reading, since it tells you who owned it and how it came to be built. The Maltings was built in 1864 and it was last used to make malt in 1966. It could be the story of any industrial maltings. Making malt in the the ancient and traditional way is being revived in the USA. That's great news - I know about a few people who are doing this. If you are making malt on a small scale, using traditional techniques and I have missed you out, please let me know. Summary: "Malt is the main ingredient in the national beverage, beer. For centuries the malting industry has provided a principal bridge between agriculture and the brewing industry, yet its history has been little studied. The British Malting Industry since 1830 is the first overall account of malting, dealing with the processes, products and sales, owners and employees, and with the evolution of what in 1830 were almost all small, local businesses. Christine Clark traces the influence of the growing demand for beer in Victorian England, and of the increasing power of the large breweries, on the malt industry ..."
We have spent some 10 years arguing that that the "first farmers", the Neolithic culture that brought cows, crops and ceramics to Britain 6000 years ago, possessed the material culture necessary for turning cereals into ale, and that there is sufficient archaeological evidence to merit investigation. Nobody in the archaeological community could be convinced. It is still considered to be a controversial theory. We have no idea why. Maybe it is a paradigm shift too far for some archaeologists to bridge, that cereals were initially cultivated for their potential sugars, a status crop, and not for their starches, a staple crop. So we considered investigating an era in which there should be no controversy. We visited the island of Wyre in Orkney, and inspected "Cubbie Roo's" castle. This was built by Kolbein Hrugr, hrugr means "heap", he was a big man. It is mid 13th Century and one of the older mortar and stone built castles extant in Scotland. It is a fascinating site on one of the now remoter islands of Orkney. We were surprised, amazed and overwhelmed to find a stone built "mash oven" in an outbuilding round the back. Our excitement was because this could be the oldest mash oven in Europe. This building has a stone bench, perfect as an ale store, and drains. It would be very suitable for making ale, but so far archaeologists have interpreted this as just an ordinary oven. Cubbie Roo's mash oven, Wyre, Orkney. We are lucky on Orkney to have well preserved Viking sites. 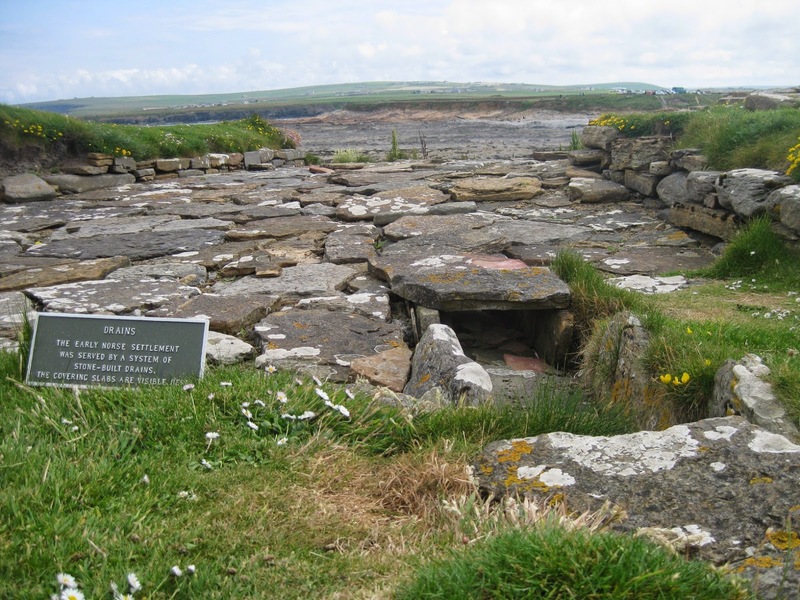 A friend and neighbour suggested that we might like to look at the drains at the site on the Brough of Birsay. Drains are significant for brewing installations. The mashing process makes sugars from the malt and these are very sticky and messy. Any spillage or accidents have to be washed away, and the brewing equipment has to be kept clean. A brewery cannot function without effective drains. There is a massive drain running down the middle of what I think is the head of the Viking causeway, most of which has been eroded by the sea. To the right of this causeway, looking back to the mainland, is the so called "Viking Sauna" (see photo below) with stone slabs on edge, supposedly to support wooden benching. I heard an expert on TV saying that "they poured hot water down the drain under these benches, to keep their bums warm". I think it's far more likely to be the brew house and ale store. On the left of the causeway, looking towards the mainland, is a building interpreted as a "Bathhouse or Sauna", in the photo below. It looks more to me like a mash house. It has a bench and a large hearth and drains along the wall. One end has been lost to the sea, and it is thought that there was a large hall or langskaill further out to sea. I was puzzled. These installations are little different to the Orkney Brewery, which is just down the road at Quoyloo. Rob Hill's Swannay Brewery, also on Orkney, uses the same installations - a mash tun and fermenting vessels. How on earth could anyone think that these buildings were a Bathhouse and a Sauna? Maybe they knew absolutely nothing about how beer is made. When I get puzzled by archaeology, I like to read the original excavation reports. This tells me what came out of the ground and there are usually nuggets of really useful information that are lost or not mentioned in summaries. 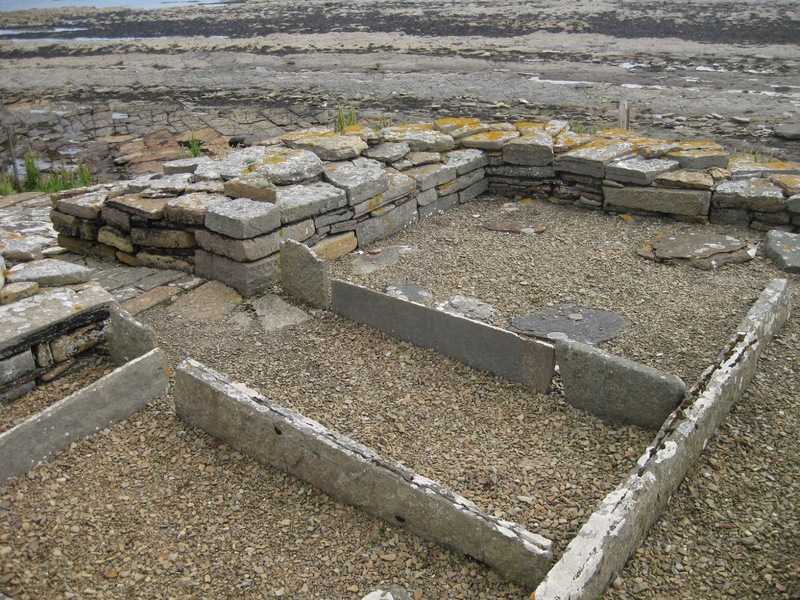 The earliest reference to 'Viking Bathhouses or Saunas' that I could find came from Dr Alexander Curle's excavations at Jarlshoff, Shetland, published in 1935, in the Proceedings of the Society of Antiquaries of Scotland (PSAS 69). He wrote that "...the presence of such a drain, and the condition of the ash deposited within it, suggest the possibility of the remains of a bath-house existing nearby." (page 284). Curle explains that this is the first Viking settlement excavation in Britain, and that his interpretations are based upon the work of Thorsteinn Erlingsson, who wrote about Icelandic settlements. In his book Ruins of the Saga Time, published in 1895. Erlingsson describes the components of the traditional farmstead house, including the bath-stofa or bathroom. He describes it as being part of the main structure and it is not a separate building. 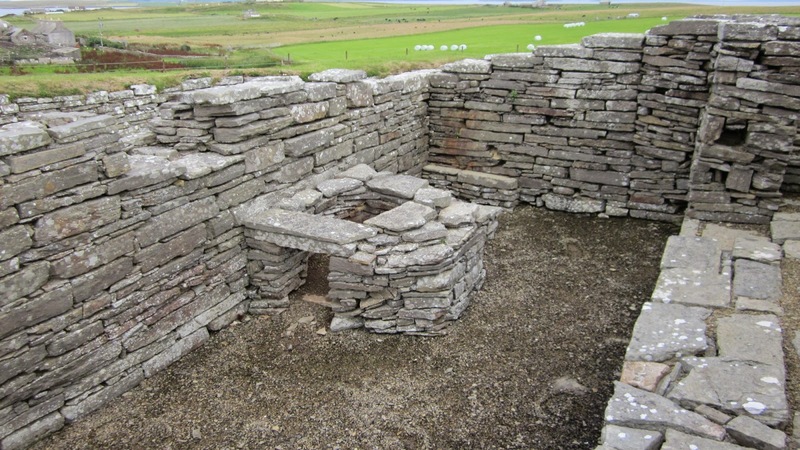 Jarlshof, Shetland - is this the bath house, hof, a religious building or a brewhouse? 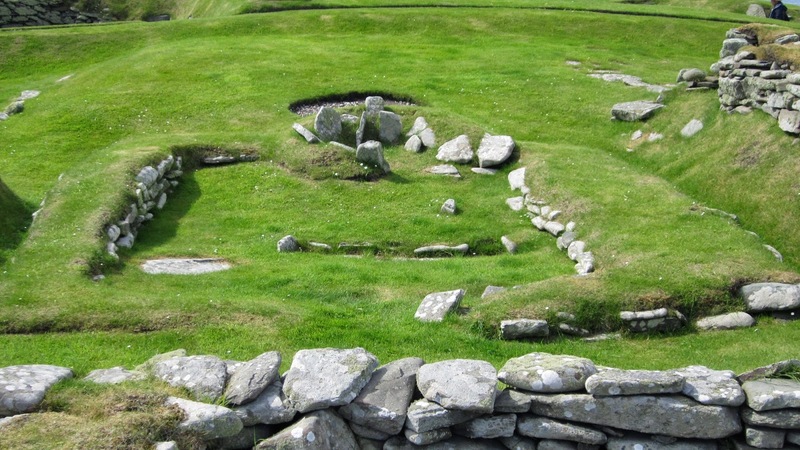 The structure in question at Jarlshof (see photo above) was beneath a mausoleum and it was not excavated until the 1950s by JRC Hamilton. Alexander Curle did not actually excavate it. In the foreground is a large longhearth and a substantial drain. To the rear of the building there is what looks to me like the bowl or footings of a grain drier. So how on earth could Dr. Curle know that it was a bath-house, other than making the assumption that it was, because of the drains and and a means of heating water? This remained a mystery to me until I stumbled across Dr. Alexander Curle's excavation report for another Viking age site, at Freswick, Caithness, Scotland, published in the Proceedings of the Society of Antiquaries in 1939, see PSAS 73 . In this, he describes a feature that, at first sight looks very much like a small Roman style bath-tub, with a large hearth and drains. I was devastated, despite the complete absence of any mention of bath-houses in the Sagas, here was an archetypal bath-house. The Sagas describe the practice of bathing in streams, lakes and rivers. There were even open-air hot baths in Iceland, thanks to the natural hot springs there. Otherwise the Vikings habitually bathed in tubs of hot water in the andyri or porch. Even the King of Norway took his bath in a tub. "... as part of the re-examination of this building through the surviving records, several problems became clear, the most significant being the complete stratigraphical separation between the secondary structure and the underlying drain. These could never have been associated and thus the secondary building is unlikely to have been a bath-house." It was now obvious to me. Dr Alexander Curle was already aware of Freswick when he excavated Jarlshof, and this had influenced his interpretation. It has also influenced the interpretations of Viking sites for many other excavators and archaeologists since then. Whenever they find drains and a means of heating water, they interpret it as a "bath-house", even though the original archetype has been found to be wrong. 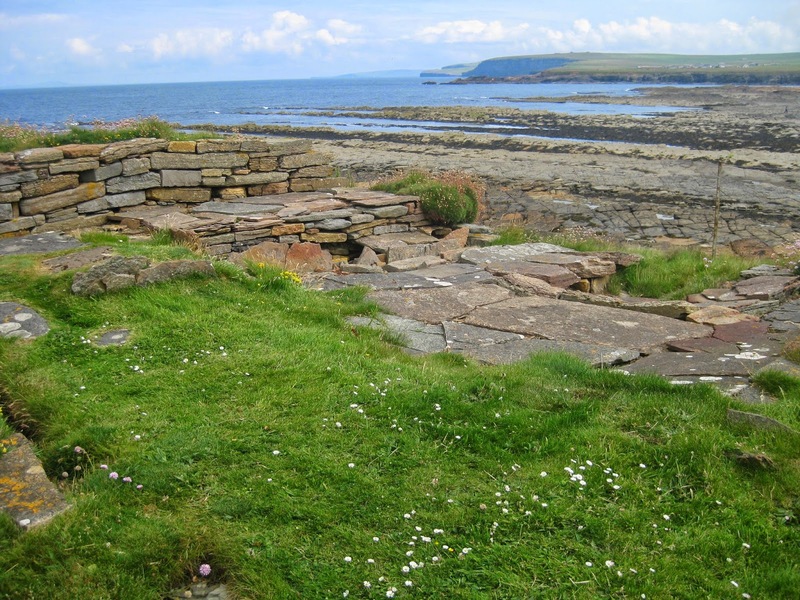 Interestingly the Brough of Birsay was excavated under the direction of Dr Curle's daughter-in-law, Cecile Curle, so she would have followed the family tradition and their interpretations. 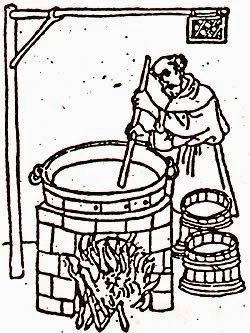 In short, most archaeologists do not know how to make beer from the grain. They certainly drink it, and they may even have made beer from kits, but they do not understand the processes, and so they do not recognise the installations in any era up until the late Mediaeval when monasteries brewed. We wrote a paper for the EXARC Journal, it has been peer reviewed and it is currently on the member's only section of the Journal. It will be released for everyone to access, download and read in the near future, probably later this year. In the meantime, here is a shorter version of that paper, published in the Orkney Archaeological Society Newsletter. We called it 'Where did the Vikings make their ale?'. Lars Marius Garshol has been studying Norwegian Farmhouse brewing for a long time and is an expert in this field. The methods and equipment that he describes seem to us to have changed very little, if at all, from those of the 10C. For anyone who wishes to understand or recreate Viking style brewing his work is an invaluable resource. Here is his Blog. Mead is frequently mentioned in the early Germanic literature, more so than ale. This, together with the Saxon mead halls of the poetry, gives the impression that mead was widely available. Everyone drank mead because honey was widely available. However, a functional and numerical analysis does not support this. 2 to 3lbs of malt to make 1 gallon of Ale or Beer, or approximately 1kg to 3 litres. Prior to 18th Century, bee keeping was unscientific and honey gathering was a destructive process. Thomas Wildman in 1768 describes these improvements. Traditionally bees were kept in voids of many sorts, skeps, hollow logs, and clay jars. The bees created their own combs inside, often cross attached. The only way to get the honey was to destroy the colony. In 1860, L.L. 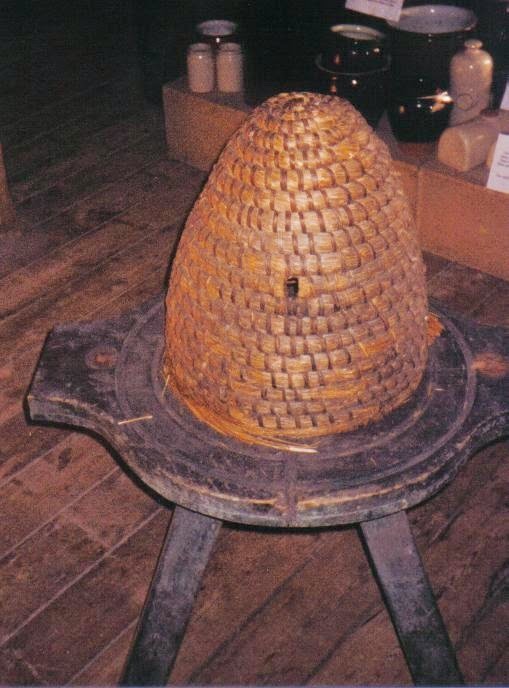 Langstroth developed a design for hives with exchangeable combs and it was now possible to harvest honey without damage. 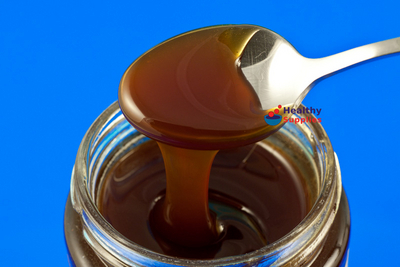 Before then honey was a scarce and valuable commodity, and highly prized. However malt is readily available. All that is needed is a crop of grain, preferably barley, and a malt barn to process it in. Today honey is about 10 times the cost of malt, weight for weight. In mediaeval times it may well have been even dearer. Bere barley is an early, primitive but very vigorous strain that was certainly grown by the early Viking farmers in Orkney and is still grown to this day. It is the only arable crop that will grow in the far North in places like Iceland. Gordon Childe noted that the impression of a grain of Bere was found on an Unstan Ware pot in Orkney, dating from the 4th Millennium BC. Svein Asleiferson was a renowned Viking warrior. He is mentioned in the Orkneyinga Saga. He was also known to be a fastidious farmer. He would spend the spring personally supervising the sowing of his crops, then spend the summer on raiding trips. When he returned in autumn he would again supervise the harvesting of his crops, and again go raiding until the start of winter, when he would return and spend the winter on Gairsay together with his 80 fighting men. They would probably not stay loyal and remain with him, unless he could provide some sort of hospitality for them. I suggest that he was growing his grain to make malt and ale and not for bread, gruel or porridge. I estimate that the warriors and retinue would drink the ale from about 4 tons of malt in this time, about 2,200 gallons or 30 barrels. This could easily be grown on 2 or 3 acres of good land, according to yield figures from Orkney Agronomy Institute. Finding 2 or 3 tons of honey on Orkney would not be easy. It is interesting that the Viking poetry refers predominantly to mead, with very little mention of ale, whereas the Viking Sagas refer to ale far more than mead. I suggest that mead was quite scarce and highly prized, fit for the Kings and Gods. Ale was for the warriors and mortals. It seems that malt is a very confusing thing. The word 'malt' means different things to different people. Some people immediately think of malt whisky - a single malt or maybe blended malts. Others might think of a malted milky bedtime drink, like Horlicks. Other brands are, of course, available. Or is it that sticky, viscous, sweet, dark brown syrup like stuff that you get in a tin in your beer kit? The stuff that you mix with water and boil? No, that is malt extract. Malt extract is considered to be very good for you - it's an added ingredient in many breakfast cereals. When I do demonstrations, I always take a jar of malt extract for people to taste. They are reminded of their childhood, and of eating a spoonful every day, for the B Vitamins. Malt extract is made by boiling wort in a vacuum and the technique was only discovered in the late 19th Century AD. Oh, and there is malt vinegar as well. And malt loaves. Many brewers use a liquid or a dry malt extract. Known as LME and DME, it's a main ingredient of beer kits in the 21st Century. Malt extract is also important to the modern food processing industry, particularly so in the USA it seems. Prohibition forced maltsters to think of a different way to process and sell their malt, other than as alcoholic drinks, like beer and whisky. Prohibition was the death knell to many American breweries in the 1920s. It's no wonder that so many people are confused about malt. I had a conversation about the archaeological evidence for malt with a fellow tour guide a few months ago. I thought we had a strange exchange of views, but it was only when they turned to go and mentioned that they were very surprised that the neolithic folk knew all about distillation. Did they use the pots for distilling? I realised that they thought I was talking about malt whisky manufacture in the neolithic. For this person, the word 'malt' meant whisky and nothing else. For me, 'malt' means partly germinated grain which has been carefully dried for further processing by brewers and/or distillers. It is traditionally made on the malting floor. The grain has been steeped and aerated, then it is spread out on the floor in a cool, dark, well ventilated building to begin to grow. Once the rootlet and shoot begin to show, it is gently dried in a kiln. We had been talking about two very different things. As part of writing this blog, I checked the Encyclopedia Britannica for its' descriptions of what malt is, how it is made and what it is used for. Much of the detail is correct, but there are a few salient details omitted. For example, there is no mention of the air rests that are an essential part of the steeping process. If you just leave the grain to soak or steep without air rests, then the grain will be killed. It will, effectively, drown. Ancient and traditional techniques include leaving the grain in a bag in a shallow stream. This provides the essential oxygen and water for the germination process to begin. Modern methods use huge steep tanks. Grain needs both water and oxygen to begin germination. If the steep is not aerated, then it will not take long for the water and grain to smell horrible and for the grain to be bad. It will not begin to germinate, you will not have any enzymes to convert starch into sugars and you will not be able to make ale. Or beer. Or whisky. In the first stages of germination of any grain - wheat, barley, oats or rye - the enzymes necessary for the conversion of starch into sugars are liberated, and then the growth begins. If this continues, starches are used up, so it is important to stop the growth as soon as the shoot and root appear amongst most of the grains. This is usually when the acrospire (rootlet and shoot) are one third the length of the grain. Often, descriptions in the archaeological and anthropological scholarly literature of how to make malt are not accurate. Some describe malt as 'toasted barley sprouts'. Anyone who says that malt is like toasted, sprouted barley, suggesting that it is something like dried bean sprouts, have obviously never handled proper malt. It is very important to talk to a maltster to understand how to make malt, to ask the practitioners, the skilled people who make it. Craftsmanship not scholarship. Graham brings a 25 kilo sack of crushed malt from the brewing suppliers into the house. Then he makes beer with it, using basic equipment - a mash tun, a boiler and fermenters. Lots of people have tried Graham's home brewed beer and it is considered to be top quality, good and tasty. What is this crushed malt in the sack? Where does it come from, who makes it and how? As I was doing the mashing experiments in the garden, using beeswax sealed earthenware bowls as mini mash tuns, I became more and more interested in the malt and how it was made. I studied the science of grain germination physiology, learning about what happens inside the grain as it begins to grow. It is fascinating and complex, worthy of a blog post of its' own.